It seems only minutes ago that I was tucking into freshly made heart-shaped waffles, topped with sour cream, zingy raspberries, strawberries and blueberries, and shavings of that weird brown caramelly concoction the Norwegians claim is goat’s cheese. That was my late breakfast on board Viking Sea, and already it’s almost time for lunch. But there are a few spare moments in which to squeeze a trivia quiz – and cruise passengers never miss a chance to cross swords in the gladiatorial arena of general knowledge. Teams of six are gathered in the Explorers’ Lounge, pencils at the ready, oblivious to the majestic seascape outside the double-height windows. If I hadn’t been so quick to answer “Sierra Leone” when asked to name the world’sbiggest producer of pink diamonds, my team might even have won. We were beaten by a gang of Australians, who no doubt got the above question right because the answer is… Australia. Being pipped in the quiz was probably the only disappointment of my time on board Viking Sea last month. 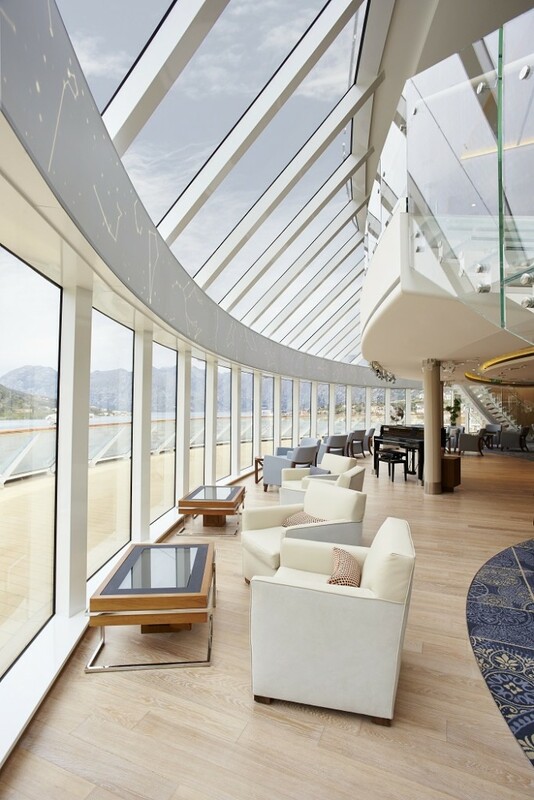 More Babington House than Grand Hotel (or country club rather than Waldorf-Astoria, for American readers), Viking Sea and its sister Viking Star, which launched last year, are the very opposite of black-tie nights and formal dining. In a world where cruise ships have grown to undreamed-of sizes, carrying 6,000 and more passengers, and where each new vessel has to outdo the last with ice rinks, go-kart tracks and scary waterslides, Viking has taken a leap forward and a step back at the same time. 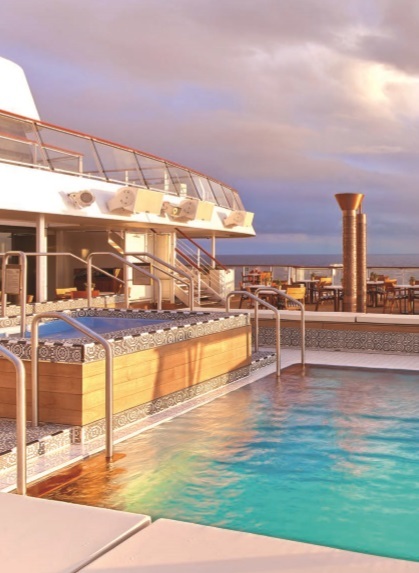 A leap forward in ambience and décor, with understated Scandinavian design – all blonde woods and calming colours – and a step back to a manageable-sized vessel carrying fewer than a thousand passengers, with all the best facilities but no unnecessary distractions. Instead of corporate-style furnishings, Viking Ocean ships are decked out with the kind of chairs, sofas and tables that would look appealing in the show flat of a fashionable London apartment block. In the nooks and crannies of the Living Room atrium, on the two levels of the breezy Explorers’ Lounge, and even in corners on the open deck, theyare arranged in comfortable room-sized groupings. This is décor to make guests feel at home, rather than to overawe them into a breathless state of wonder. There are quirky touches, like the recognisable faces adorning the cushions in the theatre, and the children’s paintings – from schools in China supported by Viking donations – that hang in every cabin. And I was regularly amused by the two black crows making themselves at home in a corner of the Winter Garden. In another touch that reminds me of home, Viking Sea has books everywhere – scattered about on coffee tables and shelves, some even sharing space with towels by the pool. adventurer Roald Amundsen. But elsewhere they’re arranged seemingly at random, rather than by author or even by theme. In other words, just like a home, not like a library. Here, the latest JK Rowling could be rubbing shoulders with a cookbook, while a history volume shares shelf-space with an illustrated tome on architectural design. That might be a little frustrating if you’re looking for something specific, but it presents great opportunities for chance discoveries. 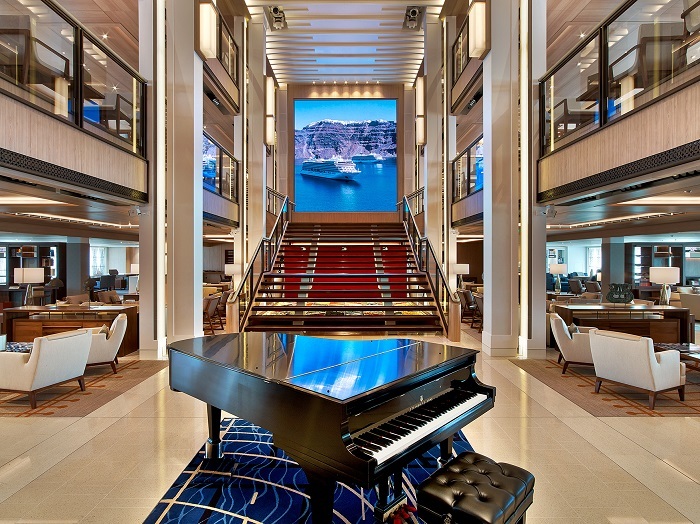 The latest vogue among larger cruise companies and their massive ships – such as Carnival Vista, which I will be reporting on in the next issue, or MSC Seaside, highlighted on our news pages – is to try to find a way to “re-connect with the sea”, by bringing back wide promenades and introducing al fresco bars and eating establishments. Viking beat them to it by putting its main restaurant on the Promenade Deck and its World Café buffet on the Sun Deck, so that both can benefit from floor-to-ceiling windows that slide open in good weather – extending the dining area on to the patio, so to speak. Until his company made their return to the high seas, Viking’s chairman Tor Hagen preached that river cruising was for the thinking man (and woman), while ocean cruising was for the drinking man. He may have revised this philosophy just a little, but there is still no place on Viking Sea for a casino. are included in the fare, as are drinks with lunch and dinner, and bar prices are kept to reasonable levels ($7.50 is about top whack for a cocktail). 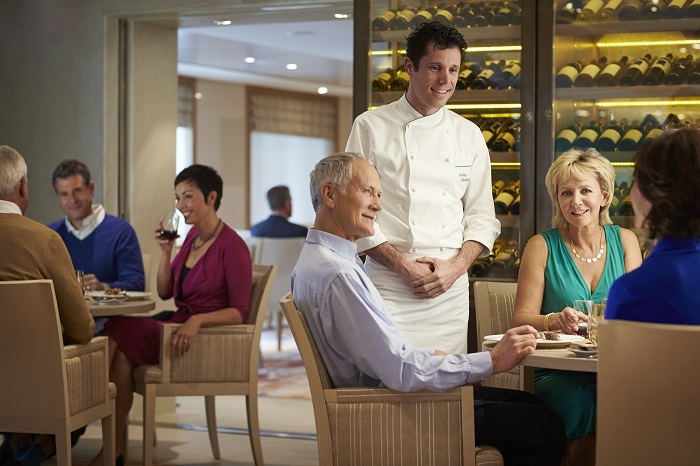 There are two excellent speciality restaurants – Manfredi’s Italian, and the Chef’s Table, which provides a beguiling selection of international menus that change every few days – but there are no extra charges, and Hagen insists that the main dining room should still offer food as good as the best anywhere on board. He refuses to claim that Viking offers luxury, however. As far as he’s concerned, if you want six-star food you should eat in a Michelin-starred restaurant ashore. It’s this modest under-selling that sets Hagen and Viking apart and ensures that their passengers are unlikely to be disappointed. I certainly wasn’t – except when I lost the quiz. Not that I’m going on about it. Mamsen’s deli counter is one of the hidden delights of Viking’s ocean cruise ships. It serves freshly made waffles, complete with sour cream, berries, and brown Norwegian goat’s cheese; the best looking open sandwiches, piled high with prawns, roast beef, and cheese; tantalizing cakes and tempting late-night bites. In fact there’s something to fill a gap at almost any time of day, from a late breakfast to a midnight snack. Created by Viking Sea’s godmother, Karine Hagen, it was named in honour of her grandmother, “Mamsen” Hagen. But the name came as a surprise to her father, Tor, when it was unveiled last year on Viking Star. “Mamsen was such a beacon,” explains Karine. “Sincere and honest, she was hard-working and liked to keep things simple. In the kitchen and in all things, she was a perfectionist. “’You use what you have,’ was one of her favourite sayings, and that’s precisely what we’ve done with Mamsen’s deli, creating a menu that reflects simple Norwegian tradition. Godmother to Viking Sea, at her recent naming ceremony on the Thames at Greenwich, was senior vice-president Karine Hagen, 46-year-old daughter of the company’s founder, chairman and chief executive, Torstein Hagen. Karine speaks seven languages and has lived in the UK, US, and Russia, working in the technology and telecom industries, as well as for accountancy firm Arthur Andersen and advertising agency J Walter Thompson. Downton Abbey. The dog features in Karine’s series of children’s books, The World of Finse, written to share her love of travel and world cultures with young readers. During the construction of Viking Sea, a collection of ceremonial coins was welded to the ship, marking landmarks in Karine’s life. They date from 1911, the year her grandmother, “Mamsen” Ragnhild Hagen, was born; from 1943, commemorating the birth of her father; and from 1970, commemorating her own birth year. Finally there is a coin from 2012 – the year Finse was born at Highclere.